(AINA) -- Recently, the Swedish Liberal Party's national congress granted the motion on the Assyrian right to form a local administration in the Nineveh Plains in Iraq, according to the Iraqi Constitution. Many of us are naturally delighted and grateful for such support. But the project risks becoming a disaster for the Assyrians if it is not handled fairly or if it is hijacked by anti-Assyrian interests, according to Fred Aprim, who himself was born in Kirkuk and now lives in California. He is the author of Indigenous People in Distress, Assyrians: The Continuous Saga and Assyrians: From Bedr Khan to Saddam Hussein. Fred Aprim has documented in both of his books the attempts to Kurdify both Assyrian history and geography. Recently, he put a comment on Facebook, where he expressed his fears that the whole project with an Assyrian administrative region in the Nineveh Plains risks falling into the hands of Kurdish interests, who want to expand their territory. He therefore calls for all Assyrian politicians who lobby for an Assyrian region to dismiss all talk of Kurdish protection and ensure that the Nineveh Plains region is tied directly to the central government. The Assyrian people well know who blasts its churches and kills its elderly and young only to implant intimidation amongst the people, so that in the end Assyrians are forced to join a scheme much bigger than themselves and even bigger than Iraq itself, the scheme which aims at expanding geographic entities coined at their expense. These entities give greater weight to the powers conflicting in such an area that has been, throughout its history, under the focus of western powers' greed since the days of "Silk Road" from Europe to the Far East. In this big game today, Assyrians are playing the role drawn to them: victims, and not players. They are victims torn between the fires of Islamization and Kurdification. And some international foreign channels talk about them every now and then to show dissatisfaction about the Iraqi government under internal bargains between Kurdish and Islamic racism. And here, western politicians and their media succeeded in showing the problem as "Islamic persecution" and the solution for it is "Kurdish protection", note that kurds themselves executed all the massacres against the Assyrian nation over centuries, and Assyrian lands in occupied Assyria (northern Iraq) are still confiscated by Kurdish leaders with the support of Kurdish occupation authorities. What do the Assyrian political organizations in Iraq say? 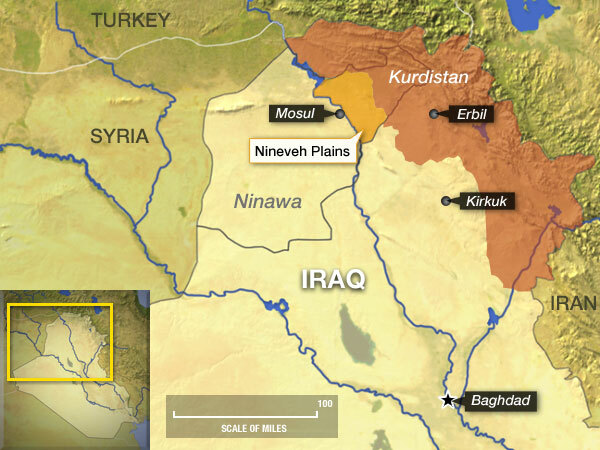 How do they feel about possible Kurdish patronage over the Assyrians in the Nineveh Plains, which today is already controlled by the Kurds? Representatives of the Assyrian Democratic Movement (ADM), the largest Assyrian party in Iraq, they say their position has not changed. In short we can conclude that ADM supports the formation of a county or a province, consisting of towns and villages in the Nineveh Plains where Assyrians make up a significant group of people. This has its origins in the Iraqi Constitution, which supports the formation of decentralized provinces, and is in line with ADM's work for self-governing administrative units for the Assyrians. It's no secret that there are "contested" areas adjacent to the Kurdish autonomy in the West and South, which both Kurds and Arabs claim and this has been so for a long time (AINA 11-10-2011). For our part, it is important that the new province is linked to Baghdad and gets a legal status of an autonomous province. The issue of "contested" areas is a separate matter and should be handled in other forums. There is and will be an interest from the Kurds and Arabs to influence the development in ways that benefit themselves. But it is up to us to manage these interests in a balanced way and the important thing is to unite our people around a common goal and to become an important player on the political arena. The question of our areas in the Kurdish autonomy which have undergone demographic changes are always present in our contacts with the Iraqi and Kurdish authorities. Finding solutions to this problem is a priority, not only for ADM but for most of our organizations. We do not see how claims about a "Kurdish conspiracy" could promote the issue of an own province. Rejecting the idea without having any other realistic alternatives is also not in line with our people's interests. Another important consideration are the other minorities, like the Yezidis and the Shabaks, who also live in the Nineveh Plains. There are different groups and disagreement even among them. These minorities also have their say and must be included in a future solution. The only possible way is if we can work with all communities and create opportunities for our people to map out and guide its own future. ADM is the largest player among the Assyrian political parties in Iraq and has received the most Assyrian votes in the elections held after the fall of Saddam. It is true what ADM points out, that the victim mentality should not dominate our lives, that we should approach the question with an open mind. But we cannot escape the fact that Kurdish interests have more to gain by incorporating us into their territory than other ethnic groups. I have in previous articles explained that the Kurds do not only want to take over the Assyrian lands, but also our ancient history (AINA 2-6-2009). Viewed in this light, it is not strange that we have reason to be suspicious of Kurdish ambitions, especially since they have such a large support from the West to form their own state. Today a small Kurdistan in Iraq, tomorrow a Greater Kurdistan, which is spreading across several countries in the Middle East. Assyrian interests weigh very little in such a large project. But the battle is not lost if we ourselves, as both ADM and the critical voices point out, act with unity.